Prolific Artist Benjamin Werner’s new solo show opening in August in Maroochydore explores the southeast Queensland coastline and its features, balancing tradition with the contemporary. 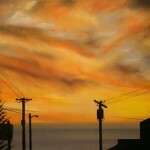 The beautiful and colourful works all in oil on canvas with their glossy smooth surfaces and gestured brushstrokes almost float between realism and impressionism with the dark silhouettes of figures and familiar architecture located between the Tweed Coast to Noosa and composed against the menacing storm fronts and sunrises. The show is only a small part of his busy 2006 calendar which will see him exhibit as part of the Brisbane Boys Grammar Annual invite only Exhibition in September and hold another solo show of all new works in December at Metro Arts, Brisbane’s main gallery. 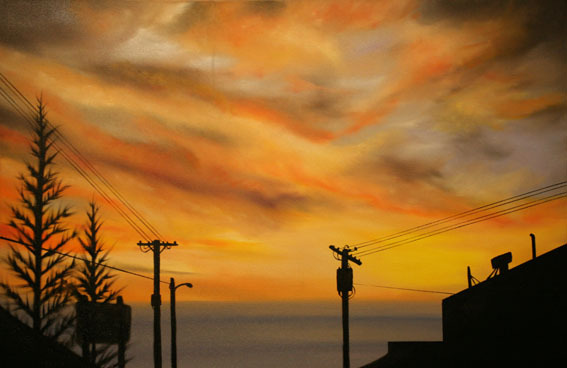 Following on from the successful 2005 Solo show “Suburbanality”, these new works also touch on the suburban and urban locals of the coastal strip through the recurring use of local flora and the rooftops of shops, houses and television antennas just poking into the frame. Having spent the last five years with one ideal in mind Werner’s explorations into the sublime and beautiful show a considered expansion into the various ideas associated with this much discussed topic and its diverse contemporary outcomes. 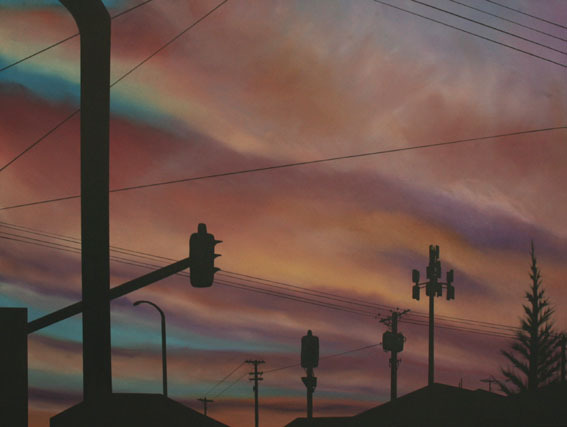 The telephone poles and powerlines in works such as “Suburban Sunrise 1, 2” dance with succession and uniformity, opening the viewer to the ideas of infinity and the continual in a modern context and in a modern world. While the continuous horizon and troubling storm scapes play on notions of time passing and nature’s overpowering forces, balancing the fragile co-existence of man and nature. Instead of cropping or eliminating certain features from the landscape Werner embraces the things most of us would leave behind or ignore in our holiday snaps. 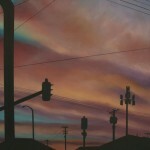 He uses the powerlines to compose small abstractions of colour throughout the storm scapes, sectioning off small focuses for the viewer to examine closer. In “Afternoon Crossing” the now familiar stack of a mobile phone transmitting tower sits alongside the humble television antenna, this could be seen as a nod to our embracing of the future, as most of us now own a mobile phone and the fact that we will all be able to receive TV though our telephones very shortly, the tower could also be seen as a taunt at the ever-changing cycle of human technologies. 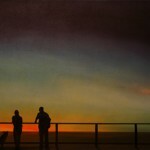 “A Morning Conversation” explores a recognizable boardwalk scene with a man and woman in discussion, we the viewer don’t get to be privy the topic or tone of the talk we just get the anonymous silhouette of the two and a pet dog. The dog is alert, ears up watching the viewer seemingly protecting or watching over its owner. It could be a father and daughter, husband and wife or two strangers embroiled in this unknown conversation but these are the extra details or lack of that make this piece even more intriguing. The recurring silhouetted figures and outlines of buildings and their almost graphic art approach hold close associations with the recent stencil art techniques that have taken over the graffiti or street art movement. The Crisp clean edges and fine detail of an Ipod cable on one of the figures or the cigarette and musical instrument of another almost look like digital graphics or clippings from glossy modern magazines while still being very strong paintings and traditional use of paint. These elements are most likely an influence of his recent position as teacher in graphic design and Illustration at Southbank Tafe and are a continuation of themes explored in previous works revealing the demolition of the “Gabba Hotel” in Brisbane. The works will have two showings as part of an initiative of Passionfruit Gallery’s Director Katie Ransom to promote talented local artists and their outstanding works. Katie has teamed up with Sajen Legal on the sunshine coast where the initial opening will be held throughout July, and then the works will move to Passionfruit Gallery and Bica Restaurant for second opening and dinner on August 18th.